Chris Hemsworth has recently donned the mantle of superhero and Norse god of thunder Thor in the recent Marvel Blockbuster of the same name. In order to fit the role and fill the boots and costume of not only a superhero but also a god, Chris needed to undergo a workout routine that was going to transform him into a god. Prior to Thor Chris Hemsworth wasn’t a big gym goer or weight lifter, he kept fit and in good shape predominantly from a range of sports and activities that included surfing, boxing and Rugby. The role of Thor required Chris to stack on an extra 20lb of muscle onto his 6ft plus frame and with no previous drive for weight lifting workouts he was going to need to focus both his body and his mind on the challenge ahead of him. 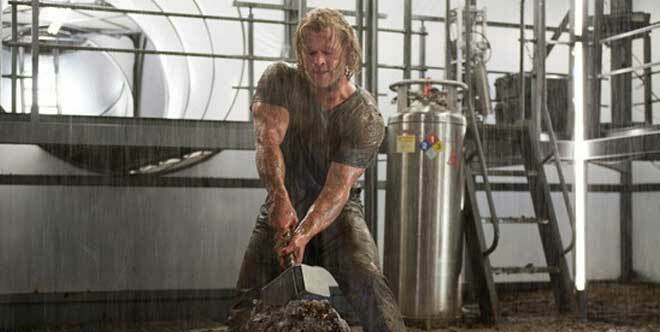 Chris Hemsworth approached his target form for Thor through two very distinct workout processes, the first aimed to stack on the extra bulk and muscle that he needed to fill out the huge frame that a character like Thor was known for. Once Chris had reached his target muscle size for the role he then needed to trim down any excess fat or bulk that he had put on his body through the huge gains in the first phase, so he then underwent a circuit based training routine that allowed him to keep his impressive new muscle frame but trim down any excess fat or bulk. In order to see such big gains in phase one Chris adopted a constantly evolving workout routine, while sticking to his core exercises he needed to vary the activities enough that his muscles did not get used to the stress being put onto them and as a result slow down his muscle gains. Try to vary your reps, weights and pace that you carry out the exercises in and even the manner in which you conduct each exercise, as an example change your grip in a pull up from an overhand grip to an underhand grip, even subtle changes such as this will help to ensure that your muscles do not adapt. For phase 1 bulking up you should group your workouts into 3 different sessions, 1st is Chest and back, 2nd is legs and 3rd is arms with the below sets and reps structure. Repeat this again for another 4 weeks making sure you rest for at least one day between each workout. Circuit one should be carried in a high intensity interval training circuit with 20 seconds action and 10 seconds rest and then onto the next, be careful if this is your first time doing interval training as it can get pretty intense. 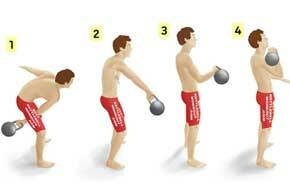 Kettle bell Cleans – With one hand at a time complete for a series of 5 reps, 4 reps, 3 reps , 2 reps and 1 reps and then repeat a second time starting from 5 repetitions again. Packing on such bulk meant that Chris Hemsworth’s diet consisted of an almost constant supply of food, which was made up mostly of protein rich foods alongside fruit and vegetables. Chris combined protein shakes with sources of protein such as Chicken and Tuna and green vegetables like broccoli and asparagus. Consumption of vegetables and fruits greatly helped in sustaining his energy that greatly helped with increasing the level of intensity that he could sustain throughout his workouts.